"This recipe is well known in Singapore and is a great hit with tourists and locals alike! It is really spicy!!!" Wash crabs and separate claws from body. Crack the shell and cut the body into 4 to 6 pieces. In a large bowl, mix together ketchup, water, cornstarch, and soy sauce. Heat skillet and the oil, stir in garlic and shallots. Fry the garlic and shallots for 1 to 2 minutes before adding the chili. Fry another 2 minutes. Add crab pieces and fry until they turn red, about 4 minutes. 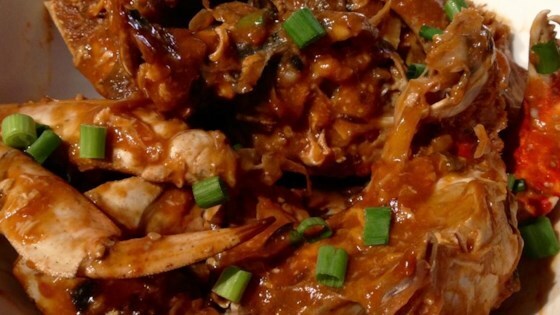 Stir sauce mixture into the skillet until the crabs are well coated. Cover the skillet and let simmer on high heat, for 7 minutes or until the shells turn bright red. Remove cover and stir in the lime juice. Stir in beaten egg until it is fully cooked. Turn the heat off and stir in green onions. Try these cheese-filled and fried Anaheim chile peppers for lunch or dinner. Too messy. Sauce was great but just too much of a mess to crack open the shell and dig out with the sauce. Maybe I might try it with cooked lump crab. This was one of the most delicious and completely messy things I have ever eaten in my whole life. Wow. Awesome, didn't change the recipe enjoyed by everyone. i lived in singapore from 1973 to 1980 and have been back a few times. this recipe is as good as i remember. a little harder then expected but well worth it. and im not much of a crab eater.